The Feverfew, pyrethrum or gold, is used for a long time to fight against headaches, lack of menstruation or rheumatic pain. It is again used regularly since the 1970s. Antimigraineuse, analgesic (including painful menstruation), anti-inflammatory, regulating activity of the nervous system. Prevention and treatment of people with migraines (migraine on dystonic field catamenial migraine, migraine due to mental fatigue), painful periods, essential neuralgia. -Feverfew is a perennial herb; its flowers are yellow and white, clustered in umbels, and resemble daisies. Stiff stem can reach 50 to 70 cm high. The fruit is an achene. It gives off a slight smell of camphor. In herbal medicine is used aerial flowering tops and fresh leaves. Sesquiterpene lactones (parthenolide), camphor essential oil, flavonoids, melatonin. For real results, treatment should last at least three months. The infusions are possible despite an unpleasant taste; it is recommended that 2.5 to 5 g of dried flowers for herbal tea. fresh leaves in migraine prevention: chew 2 to 3 leaf per day. dried leaves, capsules or whole: chew from 125 to 250 mg or mix with a yoghurt. Tablets or capsules of dried leaves from 125 to 250 mg per day. Feverfew should not be confused with the German Chamomile or Roman Chamomile who do not have the same properties. Feverfew consumption can, in rare cases, cause mild digestive disorders. In continuous use, the act of chewing the leaves can cause small mouth ulcers. Feverfew has antiplatelet effects; must not consume it with plants or supplements with anticoagulant or antiplatelet actions. 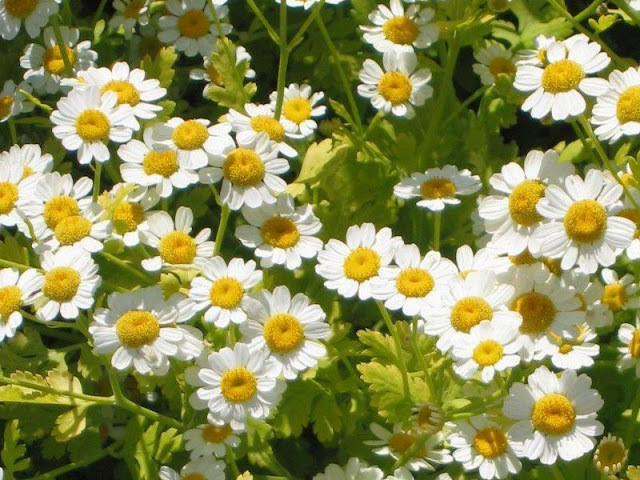 Feverfew should not be consumed along with anticoagulant or antiplatelet drugs. Do not mix feverfew and anti-inflammatory drugs. Always consult your doctor or pharmacist if in doubt.